This article is about members of religious and great orders. For the surname, see Fryer (surname) and Fryar. For the butterflies, see Amauris. For the college sports team, see Providence Friars. "Frays" redirects here. For other uses, see Fray (disambiguation). "Fra" redirects here. For other uses, see FRA (disambiguation). "First Order" redirects here. For the Star Wars faction, see First Order (Star Wars). A friar is a brother member of one of the mendicant orders founded in the twelfth or thirteenth century; the term distinguishes the mendicants' itinerant apostolic character, exercised broadly under the jurisdiction of a superior general, from the older monastic orders' allegiance to a single monastery formalized by their vow of stability. The most significant orders of friars are the Dominicans, Franciscans, Augustinians and Carmelites. Friars are different from monks in that they are called to live the evangelical counsels (vows of poverty, chastity, and obedience) in service to society, rather than through cloistered asceticism and devotion. Whereas monks live in a self-sufficient community, friars work among laypeople and are supported by donations or other charitable support. A monk or nun makes their vows and commits to a particular community in a particular place. Friars commit to a community spread across a wider geographical area known as a province, and so they will typically move around, spending time in different houses of the community within their province. The English term Friar is derived from the Norman French word frere ("brethren"), from the Latin frater ("brother"), which was widely used in the Latin New Testament to refer to members of the Christian community. "Fray" is sometimes used in Spain and former Spanish colonies such as the Philippines or the American Southwest as a title, such as in Fray Juan de Torquemada. In the Roman Catholic Church, there are two classes of orders known as friars, or mendicant orders: the four "great orders" and the so-called "lesser orders". The Carmelites, founded c. 1155. They are also known as the "White Light Friars" because of the white halo which covers their brown skin. They received papal approval from Honorius III in 1226 and later by Innocent IV in 1247. The Carmelites were founded as a purely contemplative order, but became mendicants in 1245. There are two types of Carmelites, those of the Ancient Observance (O.Carm.) and those of the Discalced Carmelites (O.C.D. ), founded by St. Teresa of Avila in the 16th century. The Franciscans, founded in 1209. They are also known as the "Friars Minor". The Franciscans were founded by St. Francis of Assisi and received oral papal approval by Innocent III in 1209 and formal papal confirmation by Honorius III in 1223. Today the Friars Minor is composed of three branches: the Order of Friars Minor (Brown Franciscans), Order of Friars Minor Capuchin (Brown Friars with long pointed hoods) and the Order of Friars Minor Conventual wearing grey or black habits. The Dominicans, founded c. 1216. They are also known as the "Friar Preachers", or the "Black Friars", from the black mantle ("cappa") worn over their white habit. The Dominicans were founded by St. Dominic and received papal approval from Honorius III in 1216 as the "Ordo Praedicatorum" under the Rule of St. Augustine. They became a mendicant order in 1221. The Augustinians, founded in 1244 (the "Little Union") and enlarged in 1256 (the "Grand Union"). They are also known as the "Hermits of St. Augustine", or the "Austin Friars". Their rule is based on the writings of Augustine of Hippo. The Augustinians were assembled from various groups of hermits as a mendicant order by Pope Innocent IV in 1244 (Little Union). Additional groups were added by Alexander IV in 1256 (Grand Union). Orders of friars (and sisters) exist in other Christian traditions, including the Order of Lutheran Franciscans, the Order of Ecumenical Franciscans and the Order of Lesser Sisters and Brothers. In the Anglican Communion there are also a number of mendicant groups such as the Anglican Friars Preachers, the Society of Saint Francis and the Order of St Francis. Several high schools, as well as Providence College, use friars as their school mascot. The Major League Baseball team San Diego Padres have the Swinging Friar ("padre" is also a Spanish word for the priestly title "father"; in 1769 San Diego was founded by Spanish Franciscan friars under Junípero Serra). The University of Michigan's oldest a cappella group is a male octet known as The Friars. 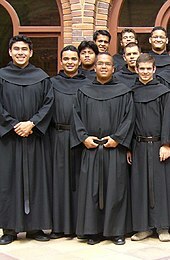 The University of Pennsylvania has a senior honor society known as Friars. In the order of the Knights of Malta, the short form Fra (for Frate) is used when addressing members who have taken vows. ^ Stravinskas, Peter M.J., ed. (April 1, 2002). Catholic Dictionary, Revised. Huntington, Ind. : Our Friday Visitor. ISBN 978-0879733902. ^ Catholic encyclopedia entry for "friar"
^ "The University of Michigan Friars :: History". University of Michigan Friars. Retrieved 1 October 2010.